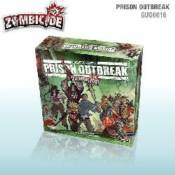 Zombicide Season 2: Prison Outbreak is a collaborative game for 1 to 6 players, for ages 13 and up. Designed as a standalone game, it is fully compatible with other Zombicide products, like the Season 1 Zombicide or the Toxic City Mall expansion. Take on the role of a survivor, each with unique abilities, and harness both their skills and the power of teamwork against the hordes of zombies! The infected creatures are controlled by simple rules and a deck of cards. Play 10 missions on 10 different maps made from the included modular map tiles, or create your own. Find weapons. Kill zombies. The more zombies you kill, the more skilled you get, and the more zombies appear. Season 2: Prison Outbreak, is designed as a playable game in its own right, in the same way the Season 1 game was. A new player can enter the Zombicide universe with this box, as it contains everything needed to play as a standalone game. Even more mutated zombies roam the streets, becoming more terrible than ever. -New equipment cards such as baseball bats, shotguns, katana, concrete saws and even gunblades. - Tokens to customize your missions: doors of various sizes, objectives, switches, barbwire, observation towers, and a security gate meant to rotate on the board to change the way you move around the prison corridors!